Nat Baldwin is a talented double-bassist, singer, and songwriter who originally hails from the state of New Hampshire but lives in Maine. 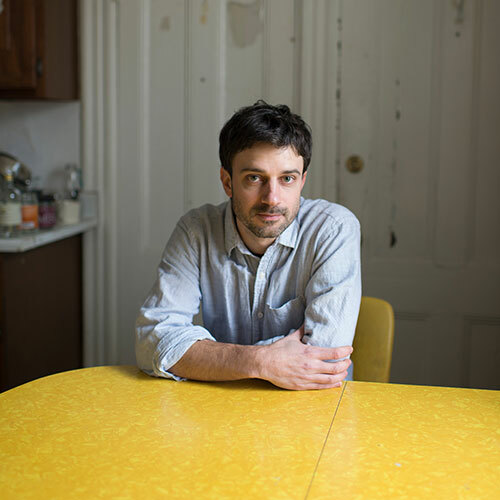 Baldwin is a skilled musician who studied with jazz and improvised music giant Anthony Braxton and, for the past decade, he has been a member of the Brooklyn, NY band, Dirty Projectors. In 2011 Baldwin released People Changes, his second solo album, and this year brings us its captivating, lovely follow up, In the Hollows, which is available now via Western Vinyl. Baldwin has a couple of shows in Massachusetts later this month and he plays The Monarch in Toronto on July 24, Casa del Popolo in Montreal on July 25, and Guelph’s Hillside Festival on July 26. Here, Baldwin and I talk about Love Lane, training for a marathon you can’t run and making music, an injured achilles’ heel, losing control of your physicality, the late, American middle/long-distance runner Steve Prefontaine, Nat’s long history of connecting athletic iconography with the music he makes, running rhythms, process-oriented parallels between bands and basketball teams, learning how to play music at 18, running/reading/music regimens, underground literature networks, Barry Hannah, Blake Butler, Lindsay Hunter, Amelia Grey, the song “Cosmos Pose” and bodybuilding, death, playing in a wedding band, Nat’s dad’s band Ben Baldwin and the Big Note, Ray Charles, seeing the Moonbeams sing the national anthem at Celtics games at Boston Garden, Larry Bird, visiting French Lick Indiana and Larry Bird Boulevard, getting into Charles Mingus, Ornette Coleman, Charlie Haden, Cecil Taylor, Albert Ayler, Anthony Braxton, and other jazz heroes, loaning William Parker a dodgy bass amp, losing interest in music, double bass and voice songs, what’s new with Dirty Projectors and David Longstreth’s writing habits, the song “Knockout,” and then we cross the finish line. Listen, subscribe, rate/review on iTunes.